Following a werewolf into a vampire lair may not be your idea of an evening out, but for Liesel Van Helsing it’s the family business. And business is good. The heir to the Van Helsing legacy makes an uneasy alliance with an elite Chinese military unit to annihilate a colony of bloodsuckers. Fangs to the throat or a bullet in the back. What’s a girl to do? This penultimate issue makes everything look so straightforward! Van Helsing, with some help from the Chinese military are making their way, following an enraged werewolf into a giant lair of vampires – what could go wrong? Pretty much everything in this case, save the Chinese agent the Chinese are massacred by these vampires – who are a lot more old school than the usual ones who have been seen. 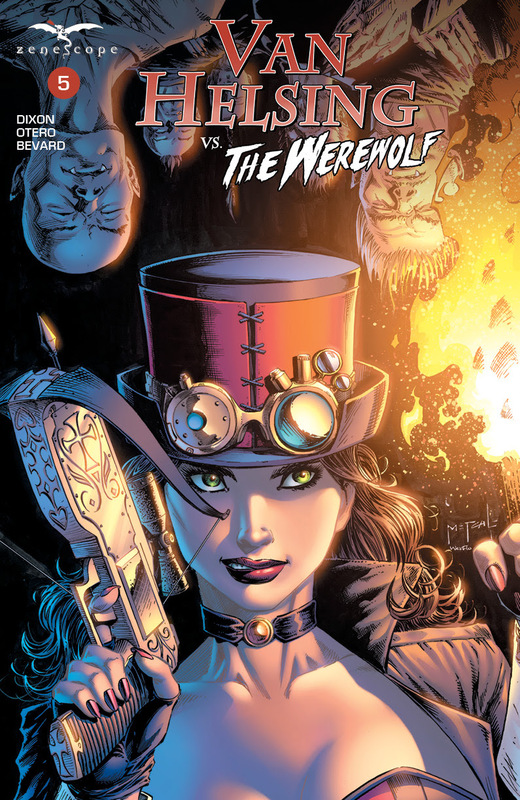 Meanwhile Van Helsing has troubles of her own, as the vampires attack her and her companion. I like the action, and the artwork for inside the caves is excellent and really gives the impressions of the nooks and crannies in the system. I still think there is something we don’t know, so it will be interesting to see where this all ends – next issue! In all, this was a good build up to the final issue, with the vampires, the humans and the angry werewolf all in one place!